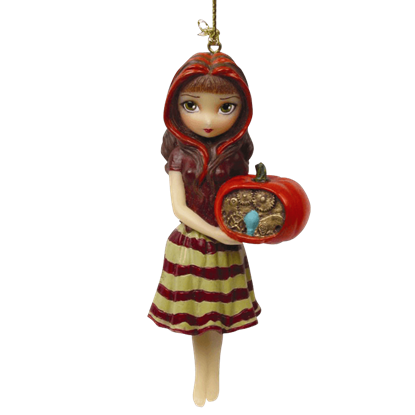 A Clockwork Pumpkin by Jasmine Becket Griffith is a beautiful hanging piece. This statue features a girl dressed in burgundy and gold holding a pumpkin with gears on the inside. This hanging piece is made of painted cold cast resin. 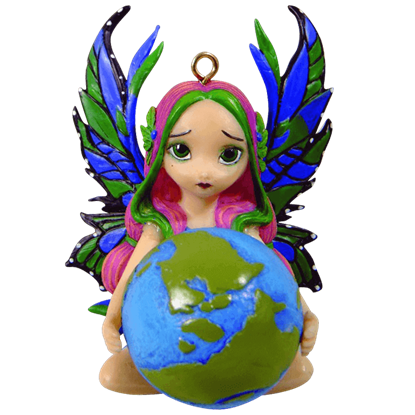 A World in Good Hands by Jasmine Becket Griffith is a piece seeming to represent Mother Nature. This statue features a fairy with green and pink hair, green and blue butterfly wings, and leaves in her hair. She is holding the Earth. It is not uncommon to see fairies with elements taken from insects and bugs of various kinds. Far from delicate, the lovely fairy in the Beetle Wings by Jasmine Becket Griffith borrows elements from a sturdy beetle. 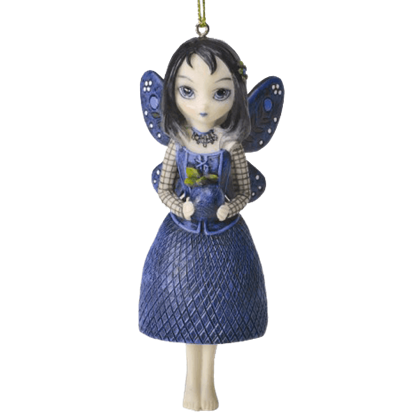 Bella Donnas Gift by Jasmine Becket Griffith depicts a beautiful fairy as she offers up a gift in the form of a berry. The question, of course, is if the fairy is named for the toxic plant or the Italian phrase meaning beautiful woman. Fairies are a beautiful reminder of magic and joy, and what better time to implement that feeling into your decor than the holiday season? 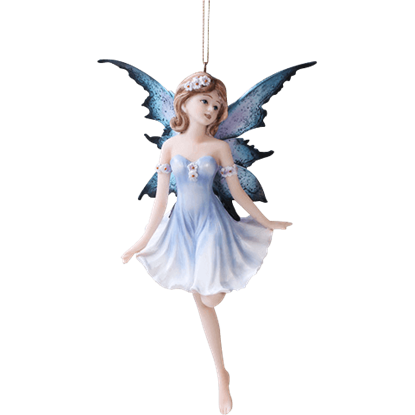 This Blue Fairy Dancer Ornament also makes a wonderful year-round accent anywhere in your home. The Bumble Bee Tattoo by Jasmine Becket Griffith presents a punk rock take on fairy style. 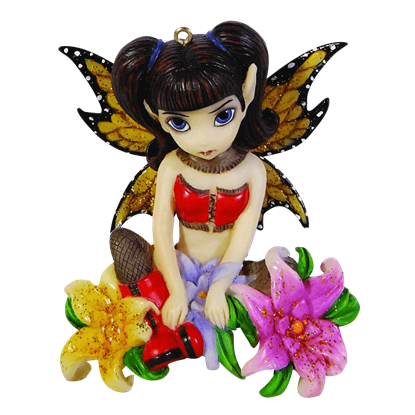 This darling fantasy statue depicts a demure fairy wearing a corset top, black pants, and sporting a bumble bee tattoo on one arm. 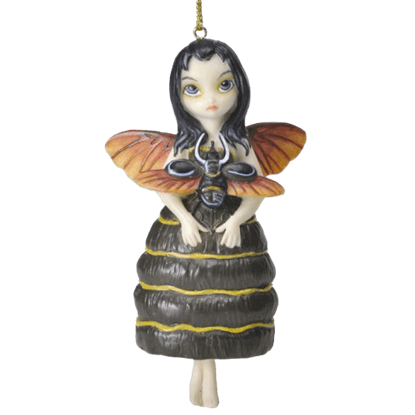 Bumblebee Fairy by Jasmine Becket Griffith is a great hanging piece for any fairy lover! 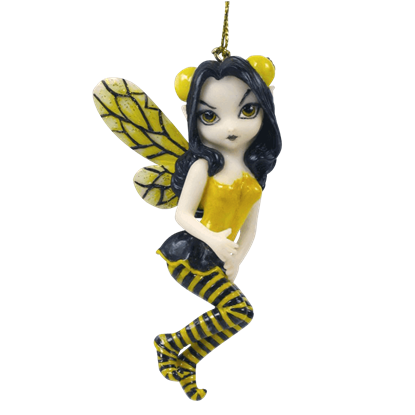 This statue features a fairy dressed in black and yellow bumblebee attire from wings to toes. This fairy is made of cold cast resin. 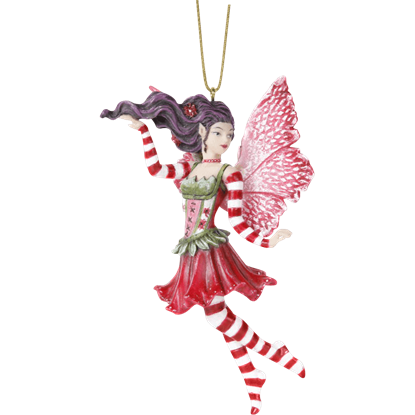 Dressed in her favorite pair of red and white striped stockings and sleeves and with her red and white poinsettia dress on, the red and white winged fairy in the Candy Cane Fairy Hanging Ornament is the epitome of holiday spirit! This thoughtful fairy is looking into the eyes of the moon. 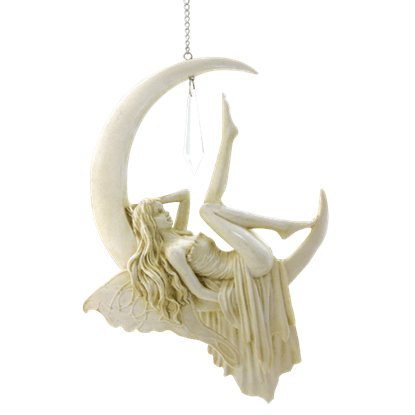 Our Crescent Moon Fairy Ornament is a unique depiction of a fairy and is a fantastic magical decoration to hang in your home. The distinctive features of this cold cast resin decoration provides depth to the appearance. The Fairy in Black Lace by Jasmine Becket Griffith depicts an adorable fairy with a mischievous look in her eyes. Made of high quality cold cast resin, this hanging statue is hand painted to reveal its unique and artistic detail. When the stars come out and mortals sleep, the fae folk step from the shadows and frolic across the land and sky. 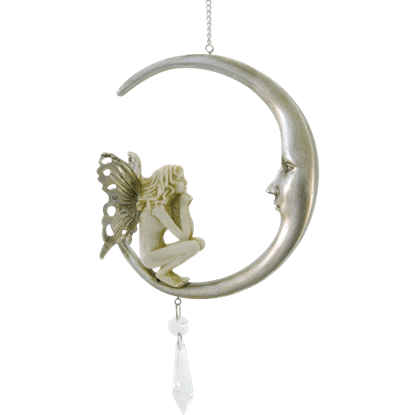 One such moment of this magical time of night is beautifully and playfully captured in the Fairy Moon Dreamcatcher. Fishnets and Flowers by Jasmine Becket Griffith is a beautifully detailed artwork. This piece features a fairy in a red outfit with black fishnets. She is sitting on the ground surrounded by flowers. This piece is made of cast resin.